Hello lovelies! Coming back from the holiday weekend, today feels like a Monday, so I'm a little thrown off that it's Tuesday already. 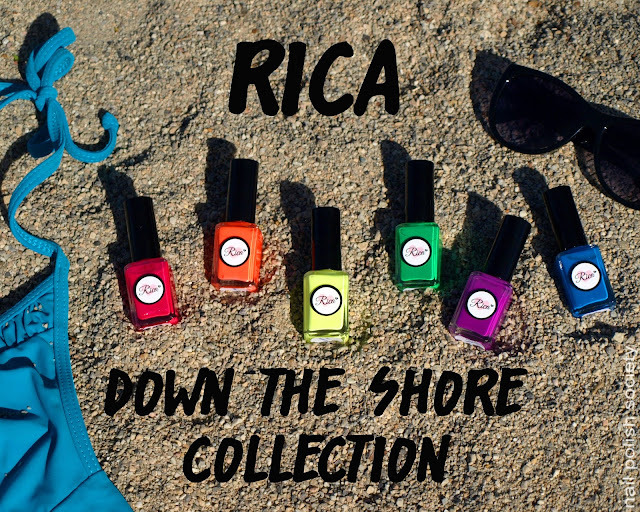 To get your work week started right I have some bright and cheery polishes to show you! This collection is inspired by New Jersey, the place creator Ricarda calls home. Holy neon water marble! Yep, this is for another guest post with another neon marble. Somehow they just go hand in hand. To check out my guest post at Peachy Polish (you heard me right! ), follow this link. I had the honor of writing a guest post for Allie of Brit Nails. I was so excited and had to create something special. Click this link to go check it out! Happy Friday ladies! It's that time again for the ABC Challenge! As per the usual, I was up late last night finishing my mani and taking photos. Whatever, no regrets! As long as it looks good, it was worth it, right? 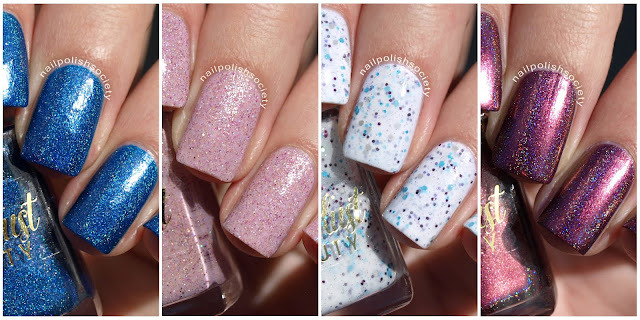 It's time again for another Paint All The Nails linkup! This time around we chose "dotticures" for our monthly theme. I've had an idea for a specific mani involving dots sitting around for months and months. I spent quite some time trying to think of a design for today, I can't believe it didn't come to me sooner. Hello lovelies! Today I am sharing with you another UberChic Beauty stamping plate review! 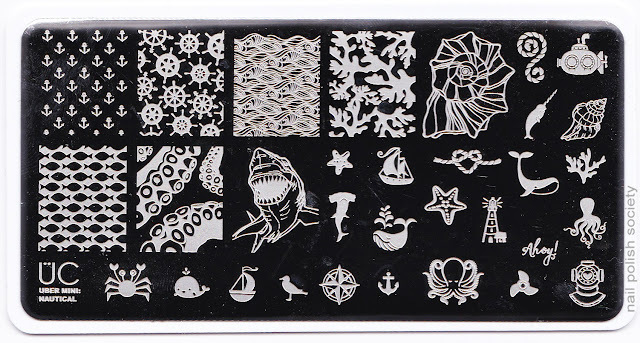 The theme for this new Uber Mini plate is Nautical, one of my favorite themes ever. If I could have my whole house nautical I would! For now though all the nautical things are going on my nails, and I'm loving it. This plate is packed with a great mixture of pretty, fun, and adorable images. Let's sea (haha) what I came up with! Happy Monday ladies! I have another Pretty & Polished shade to share with you, and this one I helped name! For the contest to name this polish there was an Indiana sunset photo as the inspiration. Becky from Naked Without Polish came up with the "Hoosier" part, and I came up with "Horizon". Chelsea the creator of Pretty & Polished generously gifted us both the prize! Once again I've been drawn in by the gorgeous offerings of this month's G.N.O.M.E. (Glitter Nerds Of Magical Existence) Box. After purchasing the January and February boxes I restrained myself for a couple months, but couldn't pass this one up. Let's take a look! Happy Friday everyone! So far I am three for three in doing my Challenge manis late Thursday night. Next week will likely be the same, but I'm hoping I'll get ahead of the game eventually! I did a guest post for Jae of the Procrastinating Polishr while she is away on an epic European vacation. Click this link and go check it out! 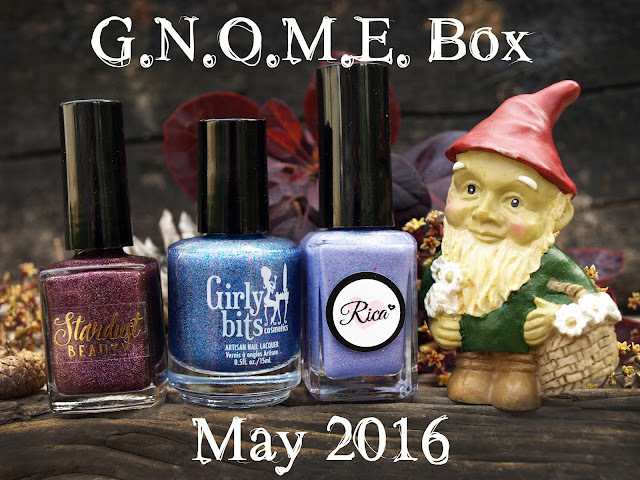 I have been looking forward to this post and sharing with you the new Stardust Beauty May 2016 Releases. I am never disappointed by Drema's creations but these four seem to be extra unique and beautiful. Today's post is going to be a little picture heavy because I had to show the different dimensions and the details of these polishes. I keep trying to pick a favorite but I just can't, I am really smitten. I think you'll love them as much as I do! Happy Monday everyone! After my recent first experience with Powder Perfect being such a positive one, I was really looking forward to trying more. Well I think I may be even more impressed with this new The Midlands collection, inspired by the legend of Robin Hood. "The Midlands is a swathe of land that cuts across the heart of England. It is home to Sherwood Forest, a mysterious place that provided refuge for the legendary renegade Robin Hood & his merry men." Hey lovely ladies! I have a fantastic collection from a new-to-me brand, Celestial Cosmetics. The Valyrio Collection was created in collaboration with my fellow blogging buddy Christine of Serenity Nails, so of course I'm already a fan. 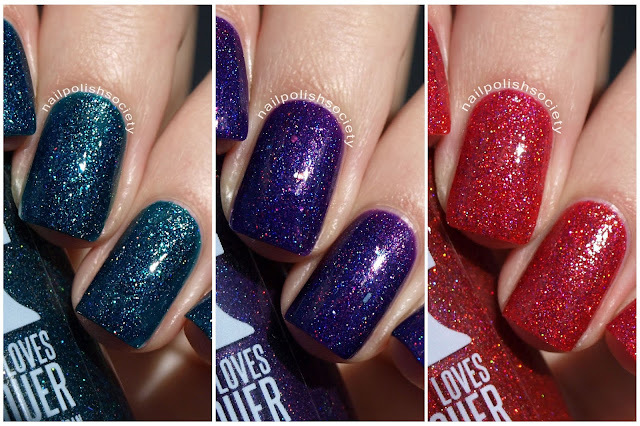 I swooned over Christine's swatches when they were released and was so excited to try these polishes for myself! Let me tell you, there is not a dud in the bunch! The Valyrio Collection was inspired by The Game of Thrones. You may have heard of it. As I'm not exactly a fan myself (sorry!) I will refer you to Christine's post here to tell you all about the inspiration. Hello my lovelies! How are you all this fine day? Today's post features a single polish, Express Yourself, from the upcoming Pretty & Polished Icon Collection Part I. I feel like I haven't had just one polish in a post in a very long time, it feels a little refreshing. I recently won this beauty and just had to share it with you! Hey there! Today I have a review of the UberChic Beauty Mini Uber Mat in black to share with you. My original Uber Mat is something I have used every day since I bought it and I can't live without it. Being such a fan, I was very interested in trying a mini and seeing if I liked it just as much. I wasn't sure if I really needed both, but now that I have the mini I've found so many uses for it! The Mini Uber Mat measures 9"x 8". I've placed it over the original Uber Mat so you can see the size comparison. The original has ten nail templates, while the mini has twenty. The black mat is specifically designed for use with lighter polishes so they can be very visible. The thing I love most about these mats is the multitude of uses. First off, I love to use it as a brainstorming tool. I'm not very good at drawing, so I don't keep my ideas in a sketchbook. So when I want to test out stamping images, color schemes, freehand art, etc, I do it all on the mat. Sometimes I get so many ideas at once that again, as an alternative to a sketchbook, I will leave the images that I like on the mat as a place holder to remember later. These mini mats are especially useful for making decals. This is such a great alternative to doing something like a blobbicure or needle drag/dry marble straight on the nail when my success rate is about 50/50. While I wouldn't personally need all twenty templates for all of my nails, I will often fill them all up with decals and then I pick out my favorite ones. That way I'm not re-doing my nails until I get it right. Hello ladies and welcome to the first day of the ABC Challenge! I have been giddy with anticipation for this day! Before I get into the nail art- If you want to know more about the challenge, check out this post for the schedule and important info. Hey everyone! I bring you today a new-to-me brand that I've wanted to try for quite some time, Aussie indie brand Powder Perfect. That name is so fitting because for the most part these formulas were a dream to work with! The Palace Collection was inspired by the classic Cinderella tale as told by Charles Perrault & the Brothers Grimm. It is comprised of three holos, two cremes, and one foil formula. Let's take a look! Hello my lovely Society sisters! It's time for a new challenge! 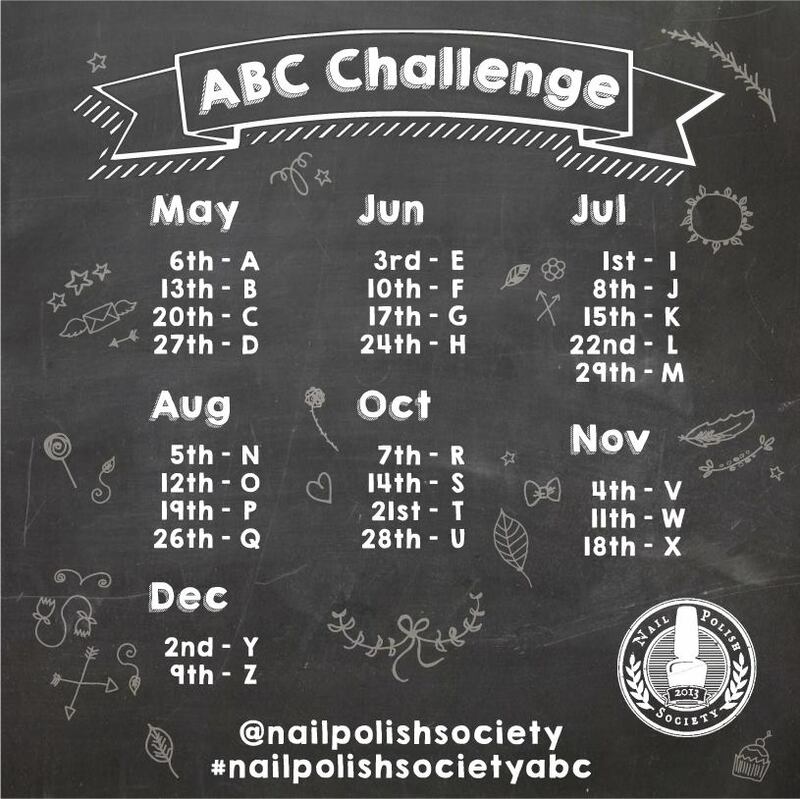 I love the consistency and creativity a challenge provides me so I've decided to begin one I've always wanted to try, the ABC challenge. This will give me something new to look forward to each week and I'd love for you to come join in the fun! Hello ladies! Today I have for you a fabulous trio from Philly Loves Lacquer made up of three stunning jewel toned polishes. They're not exactly what you'd expect during a Spring/Summer release, but then again it's Fall/Winter in the other half of the world. With colors this beautiful, does that even matter?